I have a dream that spirituality and soulfulness can be creatively reimagined for our time through inspirational workplaces that take meaning making, compassion and connectedness seriously as part of the deep, holistic wisdom we are rebirthing in our everyday communities. I know it’s just a dream, but, lately, I’ve become rather attached to their value. It all began with another darker dream. The faceless, silent ones came for me in the night. Midnight, no later than 1am. A full moon barely lifting velvet blackness. Outside my house they blindfolded me before hustling me into the driver’s seat of a car. Still silent, they sat in the back. I was aware of imminent threat. I knew I had to drive. Hours later, soft light and a new awareness began to dawn. Still terrified, I slowed the car. No response from the back. Shaking, I stopped by the side of the road, took off the blindfold and turned to look behind. No-one there. Heart pounding, I sat bolt upright in bed aware this dream was trying to tell me about colluding in my own capture, but I lacked skills or the readiness to properly understand it. Two years later it was the first dream my Jungian analyst and I began our hours with. Even so, clarity took time. It took another startling dream to make me realise that patriarchal Christianity had me by the throat and was throttling the life out of my instinctual spirituality. As this process unfolded I continued as a hospital chaplain advocating for a non-partisan approach to spiritual care beyond religious control. My blogging about this and other theological issues drew sharp criticism from Anglican church authorities in Wellington who determined my theology ‘not Christian’. Although ordained as an Anglican minister for 16 years, I was no longer in ‘good standing’, which meant I didn’t fit the requirements of the Christian organisation who hold a Ministry of Health contract to place church authorised chaplains in New Zealand public hospitals. My job came to an end. A few days ago, I stepped over the line in a ritual supported by my hospital colleagues. An enormous grief welled up, not just because I was leaving a job that I loved but also for the sense of alienation from a religious tradition that seems not to have enough flex to hold my spiritual exploration. One understandable response to the pain is to walk away blinded by anger and grief. I’ve had days like that and no doubt there will be more but, beyond the hurt, there are layers worth exploring. As I reflect, I’m aware that all of us, in some way or another, are in thrall to organisations, most often because we’re dependent on them for our livelihood. Religious organisations have been able to have a unique grip because their mythology, music and rituals explore existential questions about the meaning and purpose of existence. The existential quest or making meaning out life experiences, is what I understand spirituality to be about, regardless of religious association or not. Especially important are the experiences that confound, irritate and destabilise us because these are the ones that hold rich wisdom to enhance living through the integration of our inner and outer worlds. This is work of the psyche or soul, which has not been well understood or encouraged in the rush to leave all things religious behind. My experience in the hospital has shown that Kiwis still carry their existential questions with them and still need a safe place for exploration. This has been particularly apparent as I’ve listened to staff express how they gain a heightened sense of meaning, purpose and vocation in the workplace. It’s not just about the pay packet. This raises an interesting situation for employers. For whilst they’re already required to be concerned about the mental wellbeing of their staff I suggest that they now face the need to think through power, control and meaning issues at a much deeper level than they might ever have attempted in the past. Shared values grow in importance with the implementation of corporate values becoming a crucial test for authentic organisational commitment. My experience of capture, collusion and slow release from the ties that bound me was both a spiritual and organisational experience. There was no way they could be separated. It helped me see that the boundaries between our work and living spaces are becoming more permeable, more fluid and that this might not be a bad thing. So, I’ve begun wondering whether the breaking down of what are essentially artificial work/life boundaries, and given that the holy can be glimpsed wherever we wander, opens us up to the opportunity of bringing our whole selves to work within a reciprocal partnership model that can be life-giving for all involved. 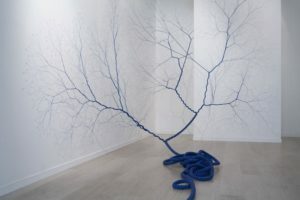 The image is one of a series of artworks by Janaina Mello Landini who unravels ropes into incredible fractal patterns that evoke tree roots, river basins, lightning strikes and circulatory systems. Landini says the idea is to ‘unstitch’ time from its inside, unravelling the threads of rope in constant bifurcations, until the last indivisible stage is reached, a point that holds everything together in perfect equilibrium. I love this process of taking something you once thought was tightly bound and unravelling it to form a symbol of life and growth and, in the process, find a new equilibrium. I think we have to do that with spirituality and the way we live and move and have our being in the world beyond the knots of the past. He invites honouring the soul – an individual task – not so much altering the institution – which may be the angle you are taking? Anyway, thanks for the post and the reminder. That’s a great synchronistic connection. And yes, honouring the soul is for me the way to go, knowing that the institution can never bend enough to cope with all our varieties. What they can do though, is have permeable boundaries, acknowledge the importance of soul and make room for it without defining how it is for people. Strangely, I’m just writing a piece about seeing the More in reflective practice groups at work! Perhaps I’m too absorbed in it, but your first comment made me think of the character Geillis Duncan, or part of her or the culture she can adopt. Then I thought it was a very authentic sort of mind-encounter, very feminine and I identify with how that clashes with the dead hand of institutions: indeed they are vertical, pseudo-rational, patriarchal, dominating-by-form, but as well as this my analogy is that increasingly as religious expression they act as if many wheels go round but none of them do any work any more. The institutional forms and what are carried explain nothing, do nothing and increasingly offer nothing. One may as well go into the woods, light a bonfire and have a dance. As for the rest, institutions of work are institutions of exploitation and function, and one may dream, but the changes one would need so that we can instead exploit artificial intelligence to enhance all forms of human creativity are likely to be pipe-dreams until there are very radical and practical changes to the purpose of producing goods and services for others. This is the second time I’ve tried to reply to you. Somehow my system doesn’t want me to say anything!! I often think of Geillis and all the women like her. What incredible strength they must have had to even attempt to stand up to the patriarchy of the time. Inspirational. Your description of the ‘dead hand’ of institutions is graphic and I do agree with you to a large extent. But living here in Aotearoa is a bit special at present with a young woman Prime Minister and the First Baby. Whilst it is certainly fascinating media fodder, this situation for us is breaking down barrier by the minute, or the nappy change as some might say. Suddenly, there are many babies in parliament and the world is shifting on its axis. Women are determining the way things need to be by the sheer reality of giving birth whilst running the country and needing their babies and carers to be near them. I can only give thanks for this and recognise that the power of this goes way beyond anything we might even contemplate or cognitively understand right now. Nothing will be the same again. I’m SO glad. And I agree with you about AI. My dream is that they learn from us and we learn from them! My heart breaks and rejoices, too, with you Sandy. To be rejected by your spiritual home for opening to deep truths and speaking them reveals the deep fears buried within our sacred institutions, and ourselves. Devastating, it is. St Francis, too, knew this rejection, and knew too the joy found in the truth and unity of life within the realm of spirit and the even deeper joy found in embracing the rejection. The Shekinah speaks with dreams and invites us into the wilderness. It is a hard place, not filled with urban creature comforts, but is so real, so wild, so open, so free, so full of wonder and awe. Know that many others of us abide in the wild, too. And you will know us as we gather round the campfire and share our stories of our journeys. Peace to you, dear sister. Let us bask together in our sojourneying. Thanks Allan and I’m with you on leaning towards the rejoicing element. Perhaps the rejection (and I have to admit there have been many other attempts, which I have been a slow learner about!) is necessary to force us into new ways of being. I think I’ve finally got the lesson and want to avoid capture again so hanging out with the wild ones around the camp fire seems a positive way to proceed. Thanks for the invite! It was you that showed me the way. It started in your note about the Lord’s prayer for the Beyonce Mass. I was on the outside desparately trying to find a way back in. It was this current post that awakened me to celebrating being in the wilderness rather than complaining about too much manna and quails. I just did what I always do when in the bush, build a fire, cook some tea, and relish the beginning of the evening’s stories. Our Jungian analysts seem to tell the best ones, eh? Thank’s for orienting me to my place in the universe. Can’t wait to hear more of your stories! That made me laugh! Perhaps that’s the great thing about trying to be a concierge and always opening the door. You never know who might walk in, or out, or who might stop a while and come around again. The most important thing is that the door has the capacity to keep opening for free flowing movement, especially when it enables a desert lifestyle. There is wonder in the sand, in the deep black of night without city lights, in the pregnant silence so alive with expectation and possibility. More to come..
Hi Sande. Your post rings true for me. I spent 19 years, from age 17 to 36, working for a bank, a good employer who paid well. But it was never a vocation for me and I always maintained a clear division between work and private life. 21 years later I’m now self employed and the boundaries between work and leisure are very fluid. As an independent publisher and supplier of books mainly to churches and church folk, I have a sense of a “ministry” and purpose. Lay preaching, and singing in and helping to administer our Christian community choir are all part of the mix. I’m free to explore, synthesize and share progressive theological ideas and write the odd song or prayer that works well in worship. That’s really interesting Philip. Thanks for highlighting your experience. It seems to me that humans are meaning making creatures and so to make an artificial separation between what we do to put bread on the table and the sitting down and eating that bread has no sensible purpose. In fact, it is often the line that keeps alienating us from ourselves and the ability to be creative, flourishing contributors to the common good. But, is that the problem? That the common good is not a widely held ideal or purpose for many, instead it is the individual good and the building up of money that matters for some and that has become the default position? I’m chuckling away here because I didn’t expect that my experience would catapult me into thinking about the nature of work in general, but there it is, doors and windows open when we have a new perspective presented to us! What a beautiful expression of the power and grief that comes from loosening old constrictions in order that the soul can be free to grow and expand.. Spirituality seeks expansion but all too often religious structures solidify and constrict. Blessings to you on your courageous journey. Thanks so much Juliet. I really appreciate your feedback. And thank you too for all the help you have given me over the years through your books. They have been a mainstay at various points and used liberally by me in two church schools where I was chaplain!